Iron is an essential element that is necessary for human survival. It plays a significant role in many enzymatic reactions in the body. This is not unconnected to its ability to lose or accept electron by changing from ferrous state to ferric state and vice versa. Bariatric surgery, especially the malabsorptive procedures, is often complicated by nutritional deficiencies if supplements are not used. Iron is one of the commonly affected nutrients. Many food sources are rich in iron. Animal sources of iron include meat, liver, poultry products and fish. Plant sources include: leafy vegetables such as spinach, beans, peas, etc. the iron in meat, fish and poultry are heme iron and quickly absorbed. Iron of plant sources is the non-heme iron. The absorption of iron takes place in the initial segment of the small intestine (duodenum and the original part of the jejunum). However, other parts of the small intestine can also absorb iron to a lesser extent. Also, iron absorption is aided by vitamin C. All calcium-containing foods such as milk and calcium supplements inhibits iron absorption. What are the functions of iron? 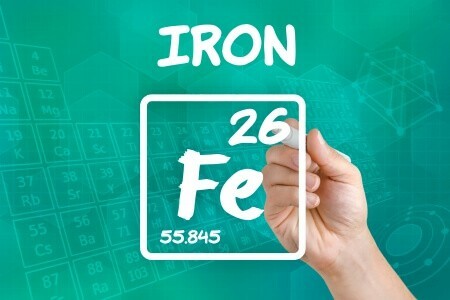 Iron participates in many biochemical reactions in the body. It is also needed for the formation of hemoglobin; a pigment in red blood cells that carries oxygen from the lungs to various body tissues and carbon dioxide from the tissues back to the lungs. Deficiency of iron, therefore, leads to iron deficiency anemia. It is also utilized in the production of myoglobin, the oxygen-carrying pigment in skeletal muscle. The role of iron in the synthesis of certain neurotransmitters such as dopamine and serotonin has also been established. Why does deficiency of iron occur after bariatric surgery? Patient who has undergone Roux-en-Y gastric bypass or duodenal switch are more at risk of developing iron deficiency. This is because both operations bypass the duodenum where a significant proportion of iron absorption is expected to take place. In gastric bypass, the food passes through the newly created stomach pouch into the part of small intestine joined to it, bypassing the larger stomach and the initial part of the small intestine. Also in the duodenal switch, the duodenum is divided and turned into a blind end while the food moves from the sleeve-shaped stomach into the part of the small intestine attached to it. Patients are unlikely to develop iron deficiency after gastric sleeve surgery or gastric banding as the route of absorption is left intact. Deficiency in this group of patients will most likely be from inadequate intake. The major consequence of iron deficiency is anemia. Symptoms and signs include weakness, easy fatigability, exercise intolerance, palpitations, paleness of palms and soles, difficulty with breathing following mild to moderate physical activity, and symptoms of heart failure (in severe cases). Others are; menstrual irregularities, sleepiness, and depression. The time of manifestation of these symptoms and signs varies according to the severity of the deficiency. Other conditions such as excessive menstrual bleeding and pregnancy may also worsen the symptoms. Iron supplements come in tablet, capsule and syrup forms. Although there are injectable forms of iron (e.g., iron dextran) they are only used in a severe, life-threatening iron deficiency state. Iron tablets include ferrous sulfate, ferrous fumarate, and ferrous gluconate. The ferrous fumarate is the most preferred form of iron supplement. Iron absorption is inhibited by calcium or calcium-containing foods or antacids and should not be given concomitantly. At least two hours should be left between iron and calcium administration. The absorption of iron is also aided by vitamin C.
This should be given if not part of the other supplements. When there is iron deficiency, it is necessary to check for the deficiency of other nutrients such as vitamin B12, and folate and correct if any. The daily iron dosage should be divided into three doses as the intestine can only absorb little at a time and the higher the dose of the ingested iron, the lesser the absorption. Iron can cause constipation and may need to be taken with a stool softener. In conclusion, iron deficiency is a common problem after gastric bypass surgery and duodenal switch and few gastric sleeve patients. The most typical symptom/sign is anemia. Supplements are available in different forms, and the best will be prescribed for you by your physician.